This glossary has been compiled in cooperation with Dougan Naio Language Services and sQuid. Controlled language: an artificial language produced by simplifying the lexis (words) and grammar of natural language. Controlled language was developed for use with machine translation and statistical analysis tools to process information in the areas of terminology management and multi-language communication in technical fields. For more on this topic, you can read my article, On Controlled Languages. Copy-editing: the work needed to improve the formatting, the style and the accuracy of a text. Copy-editing doesn’t involve changing the substance of a text. Copywriting: writing material (print, web, blogs, tweets etc) to a client’s brief or instruction. Copywriters (and translators) need to take cultural and linguistic factors into account. Creative translation: also known as transcreation or re-writing. Transcreation is mainly used in advertising and marketing and refers to the adaptation of a message from one language to another while maintaining the same objective, style, tone and context. The aim is to evoke the same emotions, nuances and connotations in the target language as were present in the original (source) language. Editing: the preparation of a text for publication. It involves selecting, revising or adapting the material. Keywords: words that refer to the main topic of, and recur frequently on, a web page or site; the words used by potential clients to carry out a search. Localisation: adapting a document to the culture and business conventions of a foreign market. Machine translation: translation performed entirely, or with the help of, a software programme designed specifically for that purpose. For more on this topic, you can read my articles: Machine Translation Hypes and Trends, A Translator’s New Best Friend?. Post-editing of machine translation: editing to correct and improve translations produced by automatic translation programmes. Fore more on this topic, please read my articles: We Need To Talk About Post-editing, The State of Post-editing, Post-editing: From Controversy To Consensus. Proofreading: the reading of a proof of a text to detect and correct production errors. Quality of a translation: the degree to which the translated text complies with the required standards of accuracy, consistency, completeness, clarity, readability, register, formatting, deadlines, etc. High-quality translations should take both clients’ and readers’ needs into account. Review: examining a translated text for its suitability for the agreed purpose and compliance with the conventions and needs of its intended target audience, market or readership. It also includes making any amendments necessary for this purpose. Revision: the systematic comparison of the original (source) and translated (target) texts before delivery. The aim is to ensure that the target text is an accurate and consistent rendering of the original, that it meets the quality requirements and that any discrepancy between the source and target texts is eliminated. A translation check therefore includes making any amendments necessary for this purpose. SEO (Search Engine Optimization): optimisation of copy and content for search engines, the aim being to increase a website’s ranking in results pages and thus the amount of traffic reaching it. Technical writing: drafting of technical documents in such a way that the layout and content conform to the terminology and style used in a given field. Terminology database: an electronic archive containing terms and related descriptive data (definitions, translations in other languages, sources, grammar notes, etc). For more on this topics, you can read my article Terminology Standards in Europe. Translation environment: computer programmes used for translation. They include CAT tools (i.e., tools for Computer Assisted/Aided Translation). Translation memory: an archive of text strings called “segments”, linked in language pairs. The segments are extracted from documents processed in software programmes and stored for future re-use. New documents to be translated are divided into segments and the segments compared and matched with those stored in the archive, i.e. the translation memory. Source text or original: the text in the source language to be translated into the target language, and revised, reviewed or amended as necessary. Sworn translation: a translation of a legal document, with the same validity as the original. The translation must be complete; every part must conform to the original document and must be accompanied by a sworn statement. Sworn translator: a translator approved and sworn in by the competent court and, in the Netherlands, on the Ministry of Justice quality register. Target text or translated text: the result of the translation, review and/or amendment process in the target language. Terminology: the relevant terms that describe the concepts specific to a given subject. For more on this topics, you can read my article Terminology Standards in Europe. Translate or translation: rendering a text from the specified source language into the specified target language. 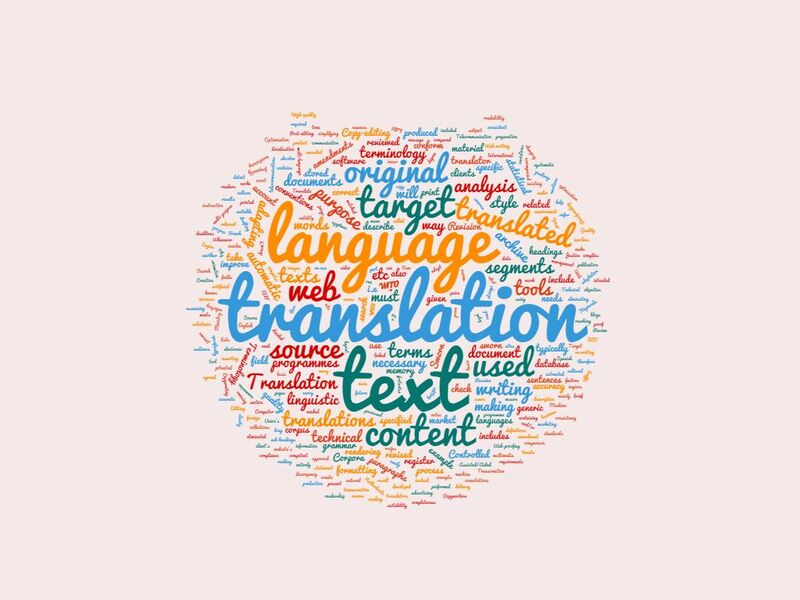 Whenever we use the word “translation” to describe a “product”, we mean a revised and reviewed translation of a source text or original. Web content: text, images, animation or multimedia (video or audio) content that is included in web sites. Web-proofing: writing a text, typically for print, in such a way that it will adapt easily to the web. For example: eliminating footnotes; inserting section summaries; and using short sentences and paragraphs, headings and sub-headings, and bullet points instead of long lists. Web-writing: writing (or adapting existing) content so that it’s suitable for the web and for the way users read web content. For example, web content will typically have shorter sentences and paragraphs, and more headings, than printed content. Please contact me if there are any terms you’d like me to include in this glossary – I’d love to hear from you.